When did Bigelow Aerospace Advanced Space Studies start and where is the AAWSA contract? In a previous post, I established that former Marine Corps aviator, Douglas Kurth, one of the witnesses to the 2004 USS Nimitz, "tic tac" UFO, commenced working for Bigelow Aerospace Advanced Space Studies (BAASS) in December 2007, some nine months before that company is said to have been awarded a Defense Intelligence Agency (DIA) contract under the Advanced Aerospace Weapon System Applications (AAWSA) program. Part of Kurth's LinkedIn profile page stated that he was "Program lead - novel and emerging space technologies targeting operational deployment in 2040" and that he "Directed and managed a team of 40 scientists, engineers, analysts and researchers" and that he was a "Technical expert in advanced aerospace concepts and aerodynamics." I went looking through official records of the US state of Nevada, for clues as to when BAASS came into being. I found a website which allowed me to conduct a search using the business name Bigelow Aerospace Advanced Space Studies. This led me to business entity E0056412008-7, namely Bigelow Aerospace Advanced Space Studies. This in turn led me to another area of the site providing numerous details of the business. It can be seen from this, that BAASS commenced on 29 January 2008, some eight months before being awarded the AAWSA contract, and up to two months after Douglas Kurth commenced work. What is also of interest is the section labelled "Officers." here, where you would expect to find the name of an individual, instead it reads " Managing member - International Space Hardware Services LLC." I looked up International Space Hardware Services LLC. I found that the file date for this business was 31 October 2007.
Who were the officers of this entity? "Managing member - Bigelow Aerospace SPC, In." You guessed it, I looked up "Bigelow Aerospace SPC, Inc." The file date for this entity was 18 January 2005. President - Robert T Bigelow; Treasurer - Robert T Bigelow; Director - Robert T Bigelow; Secrtary - Rickie Lee Golightly. Having failed to locate any documentation that the AAWSA DIA contract was awarded to Bigelow Aerospace Advanced Space Studies as suggested by numerous Internet sources; in such places as usaspending or the Department of Defense's contract awarded site; of on the Federal Business Opportunities 2008 archive website, I wondered if the contract had been awarded to International Space Hardware Services LLC or Bigelow Aerospace SPC, Inc? However, a search of all the above websites for any contract awarded to any of these entities, failed to find any such documentation. A copy of the contract resulting from solicitation number HHM402-08-R-0211, dated 18 August 2008, issued by the Virginia Contracting Activity, on behalf of the Defense Intelligence Agency, for the Advanced Aerospace Weapon System Applications program. Now for the wait. Or do we need to wait? On 4 May 2018, KLAS TV in Las Vegas carried a news item, and written report by George Knapp. As you can see, section 26 of this form "Total Award Amount (For Govt. Use only) shows a figure of $10,000,000.00 which seems to indicate that this is indeed an image of part of the awarded contract. So, does KLAS TV have a copy of the actual contract? Perhaps a concerted campaign of emails to the station might release a copy? Over to blog readers to see if they consider whether this approach is worthwhile. 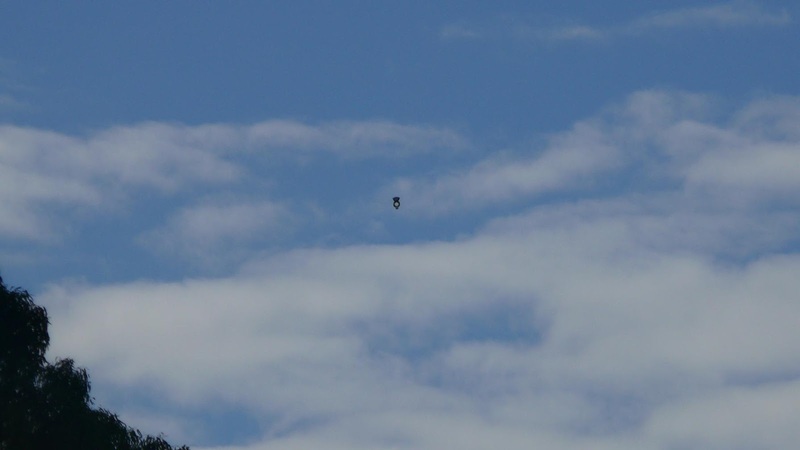 Australian UFO groups and individuals are constantly receiving digital photographs and videos showing what are, to the photographer, unusual images. Groups and individual researchers are asked to comment as to the nature of the object. 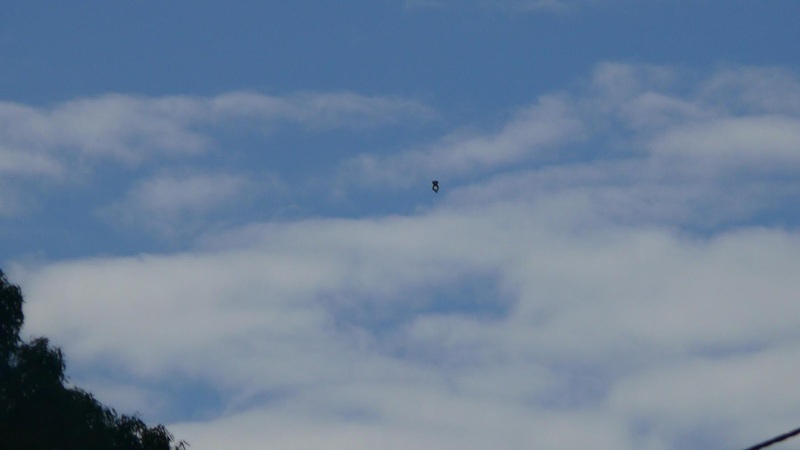 The "UFO" in the picture/video frequently turns out to be an out of focus bird/insect; a sun dog; searchlights on clouds; internal lens reflections of such sources as the Sun and Moon; and of course, fake, computer generated images. "Central Coast, NSW. 11 March 2018. 11am. I was in my garage searching for some information about my car when I heard the local bird life in an uproar. I went outside to see what was disturbing the birds, thinking it was the resident sea eagles or maybe a falcon flying about. The majority of birds were magpies, 10-20 in all, crows and a couple of curruwongs with a few silver eyes. What struck me as being unusual is the number of magpies. Usually you see them in a family group of 2 adult birds with 2-3 young ones flying around them. On further investigation to see what had made them become so distressed I saw an object drifting away from me at about 60-80 metres above the ground travelling at about 1-2 metres a second. It was travelling in an easterly direction and did not change course or alter its height above the ground. There was no noise. Thinking it was a drone no change of direction. When I first saw it, it was probably 200 metres away. It was a dark colour with a round appearance in the top half with a ridge around this section and the lower section looked like a hoop hanging below it with some sort of grey object attached to the lower section of the loop. I managed to get some pictures of it and the best one is attached to this report. Do you think this is a UFO?" Immediately upon seeing the pictures I thought that I knew what it was. Anthony spoke to the witness and emails were exchanged between the two of them. Here are the pictures. 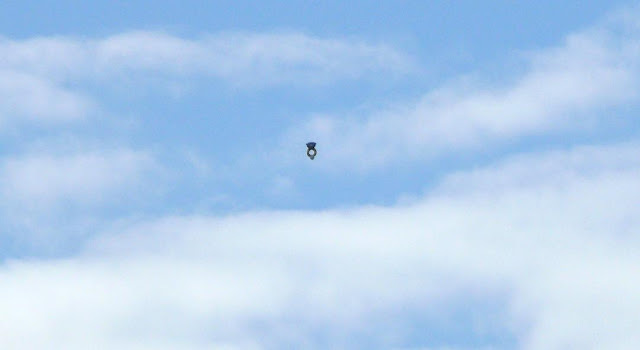 It was a Mylar, helium filled party balloon! The witness himself arrived at the same conclusion. Another IFO (in this case an Inflated Flying Object) to add to our list. P.S. A check of the weather for the location from where the photographs were taken, revealed that on that day, at that time, the wind was blowing at 9km/hr from the West, which would naturally cause the balloon to drift gently to the east. I would like to thank the individual who took this latest photograph, for their permission to reproduce the photos and the text of their report to UFO Research (NSW) Inc. I have been browsing the Internet for any additional information about the 2008 Defense Intelligence Agency's Advanced Aerospace Weapon System (AAWSA) program's solicitation number HHM402-08-R-0211, and a subsequent contract issued, I understand, to Bigelow Aerospace Advanced Space Studies. FOIA-00065-2010, Wilkins, Quincy, FOIA request documents for contract #HHM40208R0211. "Federal Sources Inc.provides research,market intelligence, budget analysis, survey method,management, and technology consulting services to the Federal government...The company serves federal and state government officials, contracting officer technical representatives and program manager...The company was founded in 1984 and is headquartered in McLean, Virginia. As of 10/23/2003, Federal Sources Inc. is a subsidiary of Washington Management Group." "FedSources' team of librarians proactively submit FOIA requests for information on awarded contracts greater than $5 million...As a client, these documents are available to you in our extensive online library of over 5,000 downloadable documents..."
So, Quincy Wilkins as an employee of Federal Sources Inc., was asking the DIA for a copy of the contract to enter it into the Federal Source Inc. library. Can we find a copy of the contract this way? The question is, did the DIA supply a copy of the contract, and it possible to locate a copy of this contract today, rather than wait for the DIA to respond to our mutual FOIA requests? I am pursuing my investigations into these questions, as the WayBack machine under www.fedsources.com captured multiple images of the website, both in 2008 and 2010, and it will take a little time to go through these. If any blog readers would also like to take a look at these multiple website snapshots they would be welcome. One possible short cut available to us, if any blog readers is, or knows anyone who is, a current client of Federal Sources Inc., would be to ask you or them to log into the Federal Sources Inc. website and submit a request to their contract library database for contract#HHM402-08_R-0211. In the meantime I will send off an email asking Federal Sources Inc if they would conduct a pro bono, once off search for me. One of the aspects of the Advanced Aerospace Weapon System Applications (AAWSA) program/Advanced Aerospace Threat Identification Program(AATIP), which has aroused my interest is, if the project was not funded by Federal contract until sometime after 5 September 2008, why does almost everyone state that the program started in 2007? I decided to undertake some research based on the available public information. 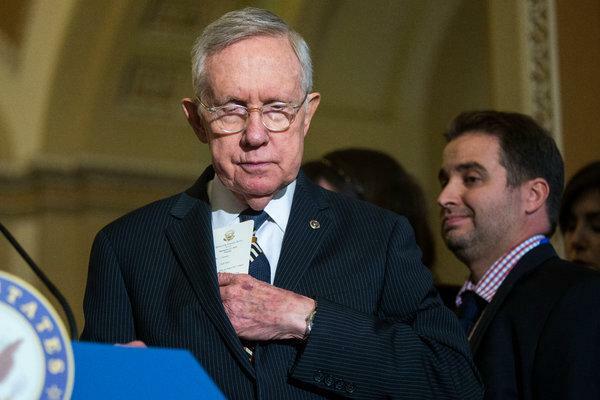 I started off by reading material which made mention of Senator Harry Reid. The New York Magazine, edition dated 19 March 2018, contains an interview between Eric Benson and Senator Reid, and quotes Reid at length, about how the program started. "I'm in Washington in the Senate and Bob Bigelow called me - I kept in touch with him over the years. He called me and said, "I got the strangest letter here. Could I have a courier bring it to you?" I said, "Sure." He didn't want to send it to me over the lines for obvious reasons. I read the letter. The letter was from a federal national security agency. Okay. The letter said, "I am a senior, long-time member of this security agency, and have a PhD," - I can't remember in what, in physics for sure, maybe math also." And the letter said "I'm interested. I'm interested in talking to you, Mr Bigelow. I have an interest in what you've been working on. I want to go to your ranch in Utah." "...I called Bigelow back and said, "Hey, I'll meet with the guy." I called the guy. He said, "I don't want to meet at my office. I don't want to meet at your office. Where can we meet?" I said, "Come to my home." The two of us met and I was terribly impressed with him. Very low key scientist. He told me of his interest. I called Bigelow and I said, "This guy, I've checked him out and he seems like a pretty nice guy and his credentials are as he says." He went, met Bigelow, and after I don't know how much time went by, he came to me and said "Something should be done about this. Somebody should study it." I was convinced he was right. I said "Well, if you were me, what would you say to people in power in the United States Senate who have huge control over the spending of defense money?" And here's what he said "What I will do is to prepare something for you that anyone can look at that wants to, it's strictly science." He put it in scientific language - what the study should consist of. "I, at the time, was the leader of the Senate and I called two of my friends who for many, many years were like brothers. One a Democrat, one a Republican. They controlled for quite a number of years the Defense Appropriation Subcommittee. It was Stevens and Inouve. "...What we decided to do - it would be black money; we wouldn't have a big debate on the Senate floor over it. They would put it in their defense appropriation bill, 11 million bucks. The purpose of it was to study aerial phenomena. The money was given, a directive was given to the Pentagon, to put out this bid, which they did." Unfortunately, this article contains no mention of the dates all this happened. We now know that the "solicitation" from the DIA re the AAWSA program was dated 18 August 2008, with a closing date for bids, of 5 September 2008. I have searched the "Congressional Record" for both FY2008 and FY2009 but failed to find any mention at all of the actual passage of money for the program. For example the Congressional Research Service document "Defense: FY2009 Authorization and Approriations" by Towell, Daggett and Belasco, doesn't mention the program. I combed sources such as www.usaspending.gov , and other such resources, but nowhere did I find any evidence for the date the contract was awarded to Bigelow Aerospace Advanced Space Studies. During the January 2018 interview between Giuliano Marinkovic and Luis Elizondo, Elizondo himself stated that the program started in 2007. George Knapp during a "Coast to Coast" interview with Hal Puthoff, on 28 January 2018, stated that the start date was 2007, and Puthoff did not correct this statement of date. In another "Coast to Coast" Knapp interview, this time with Luis Elizondo on 28 February 2018, Elizondo recalled that his initial discussions with the program manager (a PhD and rocket scientist) occurred sometime in 2008. There was no mention of a program start date in this interview. In a MUFON Journal article of May 2018, on page 18, Luis Elizondo says "They're going back to the fact that Bigelow got the contract back in 2007/2008." Most mentions of the start date out there on the Internet, use the year 2007 as the program start date. Is there any more definitive statements as to the commencement date? "He was the first fast-mover contacted by Princeton. The communication was strange and intriguing. He was asked to investigate an unidentified airborne contact...As Cheeks approached the spot he was being vectored to, Princeton advised him to stay about 10k as the section of Super Hornets were approaching the target. His radar picked up the FASTEAGLE twoship, but no other contacts. A moment later Princeton directed him to "skip it" and return to the ship. Since he was so close, he decided to fly over the action and sneak a peek. The sea was calm, almost glassy smooth and it was late morning on a beautiful SoCal day. Perfect conditions. As Cheeks flew over the spot he saw a disturbance on the surface of the ocean. A section of turbulent water about 50-100 meters in diameter. It was the only area and type of what he called, "white-water" describing that it looked as if there was something below the surface like a shoal or what he'd heard a sinking ship would look like. He overflew the disturbance and circled back in the direction of Nimitz without ever seeing what caused the water to froth. As he turned away, which happened to be the moment the Super Hornets converged on the location, the white water cleared and the ocean surface returned to its smooth state. The spot of the previous disturbance was completely indiscernible." So, who do you think Kurth went to work for? * Technical expert in advanced aerospace concepts and aerodynamics." So, in summary, one of the US Navy witnesses to part of the "tic tac" sighting in 2004, three years later goes to work for BAASS on what clearly is the AAWSA program. Wait though, note the date he commenced. Kurth states it was December 2007, some ten months before BAASS received the DIA's AAWSW contract! Perhaps herein lies the reason the program is said to have started in 2007? Journalist Giulino Marinkovic located Douglas Kurth, and on 28 October 2017 managed to contact Kurth ny telephone. Giuliano posed some questions to Kurth, but Kurth's response effectively was "I did something and I can't talk about it." "Dr. Colm Kelleher is a biochemist with a twenty-eight-year research career in cell and molecular biology currently working in senior management in the aerospace industry. He served as Laboratory Director at biotech company, Prosetta Corporation, leading several small molecule drug discovery programs focused on viruses of interest to the United States Department of Defense. He worked for eight years as Deputy Director of the National Institute for Discovery Science (NIDS) a research organization using forensic science methodology to unravel scientific anomalies. From 2008-2011, he served as Deputy Administrator of a US government funded threat assessment program focused on advanced aerospace technology. Dr. Kelleher has authored more than forty peer reviewed scientific articles in cell and molecular biology, immunology and virology as well as two best selling books, "Hunt for the Skinwalker" and "Brain Trust." He holds a Ph.D in biochemistry from the University of Dublin, Trinity College. What caught my eye this time around was the statement "From 2008-2011, he served as Deputy Administrator of a US government funded threat assessment program focused on advanced aerospace technology." This strongly suggests that he worked on the Defense Intelligence Agency's Advanced Aerospace Weapon System Applications program. * COMSEC Custodian and Facility Security Officer for IC latter contract period." Dr. Kelleher is currently the Vice President & Chief Scientist Environmental Control & Life Support Systems, at Bigelow Aerospace. Swedish researcher, Roger Glassel in his recent piece on AAWSA/AATIP in one section wrote that he had found a person in the Nevada area that had worked for Bigelow Aerospace between 2009 and 2010. More specifically, he was employed "in a interdisciplinary team of scientists and engineers studying advanced aerospace weapon system applications including lift, propulsion, control, power generation, signature reductions, materials and armament." Neither Roger nor I have named this individual in our respective blog posts about the AAWSA program. However, this individual is not Dr. Colm Kelleher. I believe Roger Glassel missed Dr Kelleher's LinkedIn profile as it did not specifically mention the AAWSA program. "The investigations by BAASS provided new lines of evidence showing that the UFO phenomenon was a lot more than nuts and bolts machines that interacted with military aircraft...The exclusive focus on nuts and bolts machines could be considered myopic and unproductive in solving the larger mystery of UFOs..."
"...One of the major successes of BAASS was in adopting the novel approach of utilizing the human body as a readout system for dissecting interactions with the UFO phenomenon...The evidence was multiplying that the UFO phenomenon was capable of manipulating and distorting human perception and therefore eyewitness testimony of UFO activity was becoming increasingly untrustworthy..."
"...The approach aimed to bypass UFO deception and manipulation of human perception by utilizing molecular forensics to decipher the biological consequences of the phenomenon..."
I previously reported that I had located a copy of the 2008 Defense Intelligence Agency (DIA) Advanced Aerospace Weapon System Applications (AAWSA) program "solicitation" which called for bids to undertake the work in this area for the DIA. My blog post reported some of the details contained in this "solicitation." Since then, I have continued to look for further "solicitation" documents. I can now report that I have located a fuller version. This 32 page document titled "Solicitation/Contract/Order for Commercial Items" is a 32 page document calling for bids for the AAWSA program work, and was issued by the Virginia Contracting Activity, the contract arm of the DIA, on 18 August 2008. Later, in this post, I will provide a link to the document so that blog readers may examine it, in its entirety. Others may well pick up important points that I have so far missed. The source of some of the other KLAS TV item documents, is still to be determined.